Glaciers in Alaska represent approximately 13 percent of the world's glacial area. But, according to scientists at the University of Alaska-Fairbanks, the rapid melting of these glaciers, along with a few in British Columbia, Canada, is contributing substantially (about 9 percent in the last fifty years) to rising sea level via mass input. This find suggests that thermal expansion of ocean water, or volume increase, is not the only significant player in rising sea level, and provides new evidence in the debate about the mechanisms of sea level increase. "The significance of our research is that in the past, the contribution of Alaskan glaciers to sea level change hadn't really been quantified. Now there is solid evidence to show this. Our results can be used to update earlier estimates that affect government climate change policy making," says Anthony Arendt. As published in this week's Science, Arendt and his colleagues were able to determine the change in elevation profiles of 67 glaciers (20 percent of the glacierized area in Alaska) for the past fifty years using laser altimetry and elevation information from U.S. Geological Survey and Canadian Department of Energy, Minerals and Resource topographic maps,. Laser altimetry is a process that involves bouncing laser signals from an airplane off a glacier while keeping track of the aircraft's position relative to the glacier using Global Positioning System methods. Calculated volume and area changes from the resulting dataset show not only that most of the glaciers (greater than 95 percent) have thinned dramatically in the last five decades, but also that the rate at which the glaciers are thinning has been much higher in the last five years. For example, the Columbia glacier thinned at its terminus by 300 meters from the 1950s to the mid-1990s, and in the last five years alone has thinned as much as 150 meters. 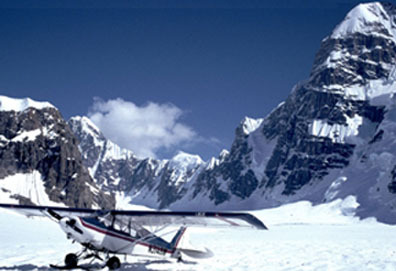 This photograph of the airplane used in the laser altimetry surveys is taken near Mount Hunter, in the heavily glaciated Alaska Range. Photo supplied courtesy of Anthony Arendt. Extrapolating the decrease in the glacial volume of the 67 glaciers to the rest of Alaska's glaciers, the authors indicate rates of overall decrease as high as 52 cubic kilometers per year from the 1950s to the mid 1990s and almost double that amount in the past decade. Corresponding sea-level increase is approximately 0.14 millimeters per year and 0.27 millimeters per year respectively, suggesting that the input by these glaciers is as much as seven times higher than the originally estimated 0.02 millimeters per year. "Thanks to the laser altimetry data we know more about Alaska's glaciers than we did before. The earlier convectional mass balance studies were limited to a few small glaciers and not representative of the whole of Alaska. Now we have a much larger sample set," Arendt says. Glaciologists Mark Meier and Mark Dyurgerov from the Institute of Arctic and Alpine Research in Boulder reiterate the significance of this research in their Perspectives article in the same issue of Science. They say that not only do the Alaskan glaciers mimic the trend of accelerated glacial melting seen globally since 1988, but also they may now lead it. In fact, the Alaskan glaciers' contribution to sea level rise is approximately equal to earlier mass balance calculations for total global glacial contribution (excluding Greenland and Antarctica), Meier explains. These glaciers contribute an estimated 8 percent of the observed rate of sea level increase over the last five years (and 9 percent for the past 50 years). Meier and Dyurgerov indicate that now, with the results of Arendt and his team's study, researchers cannot ignore the important role that glaciers play in sea-level increase.